This exhibit at FIT in NY looks amazing. I really want to go. 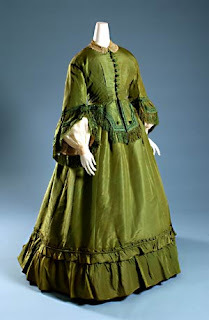 "New synthetic dyes brought exciting colors to apparel, but there were health ramifications, as an 1865 two-piece "poison green" silk tulle dress dyed with arsenic attests. "We tried not to breathe in while we were handling it," Hill says." According to the FIT article one of the best ways to wear eco-friendly clothing is to recycle. Yeah, we know. Pretty much everyone on my blogroll lives by that theory. Please go through the rest of your day knowing you are a hero and one day you may have a museum exhibit dedicated to your efforts. And try not to wear anything called "Poison Green".